Founded in 1997, Nanosurf is a Swiss based high-tech company providing scanning probe microscopes to customers around the globe. 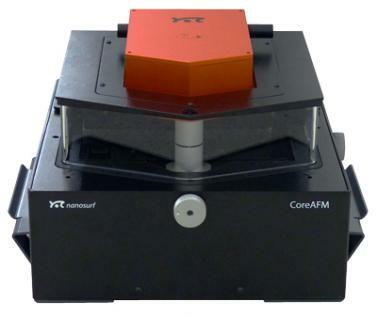 The product range starts with very compact AFM and STM instruments, followed by state-of-the-art research atomic force microscope systems, all the way up to fully customized and comprehensive next‑level solutions. Nanosurf’s customers in research, industry and teaching value the innovative approach, modularity, and ease of use of their products. NaioAFM — Nanosurf’s latest atomic force microscope. The NaioAFM integrates AFM scan head, Controller, Vibration isolation table and Sample positioning stage all in a single, compact, affordable and easy-to-use device. The NaioSTM is the successor to the well-known Easyscan 2 scanning tunneling microscope and brings together scan head and controller in a single instrument for even greater ease of installation, use, and transportability. The whole setup is very robust against vibrations and can be used in standard classroom situations. With its integrated controller, this compact, user-friendly, and affordable scanning tunneling microscope hardly takes up any workbench space. A key success factor in life science research is the combination of multiple techniques. With the Flex-Bio, you can combine the imaging, spectroscopy and nanomanipulation capacity of this system with the high-end optical techniques available for inverted microscopes. Easy fitting and positioning, automated AFM approach, and quality images — intuitive handling all the way!